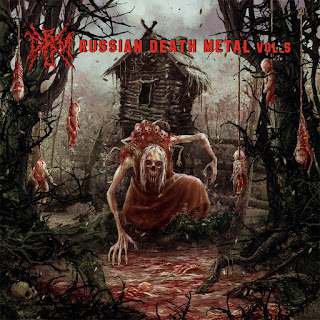 "Russian Death Metal Vol. 5", is the compilation that only a death metal enthusiast would want to hear all the way through. So many bands to pick and choose from, it is uncanny as to how all of these even fit upon this release. Such bands like The Mutilator, Contrabandist, Brainteasers, Rotting Butcher, Marble Carrion, and Rage Of Kali, are just the very few who will get your neck turning with excitement. When listening to this album, you get not just these bands, but many others as well. It is so chalk full of varying acts, that it becomes an endless release of unbeatable content. In other words, a solid mix up of death metal material, that only these array of bands, can bear of their talented craft and raw progression. "Russian Death Metal Vol. 5", being a piece of work that will satisfy the metalhead in you.